Europe conjures images of couples walking in the rain by the Eiffel Tower and riding bikes in the English countryside. And some of the region’s most notable foods don’t necessarily come from Michelin star restaurants. Americans will recognize many exotic sounding foods and treats as precursors to stateside fare. Bouef Bourginon is a beef stew made with red wine instead of water or beef stock. Ingredients traditionally include pearl onions, mushrooms and garlic and can also include carrots and potatoes. 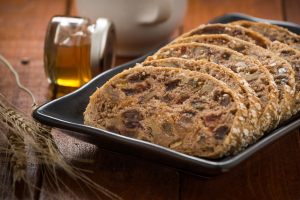 Bara brith (which means “speckled bread”) is the granddaddy of all fruitcakes as Americans know them today. It’s a fruit loaf that’s buttered and served with tea. Bara brith has a more balanced ratio of fruit to batter so it’s not as dense as fruitcake.